Wow, it’s Wednesday already and students are unloading their trucks and moving in as I write this. 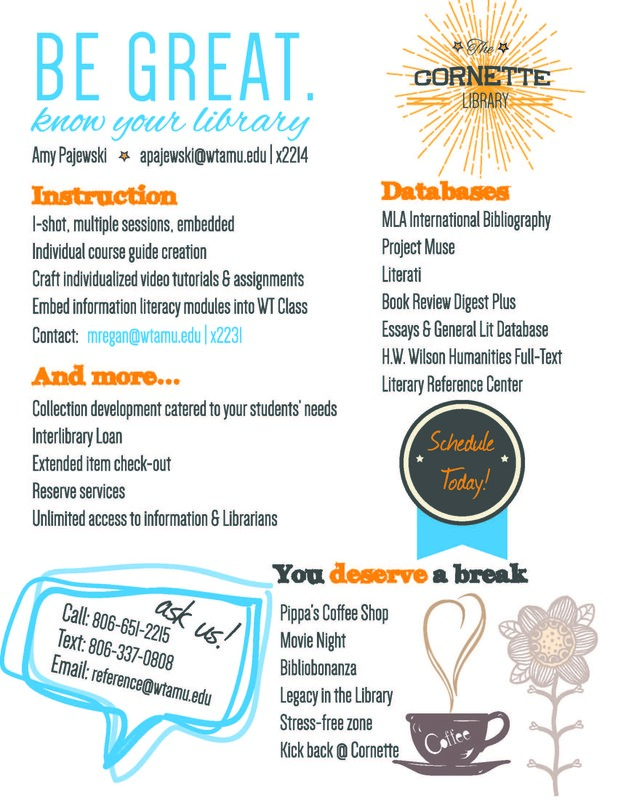 As you can imagine, we are very busy getting everything together for those students, but on this edition of From the Desk, I want to share a handout I made for writing instructors on what the library can do for them. The week before school starts means loads of faculty meetings and updates, and I was lucky enough to be invited to speak to the faculty. As liaison to the department, I am usually the first point of contact between them and the library, so it’s good to speak to and meet the new instructors each Fall. For faculty, the difference lies in what information I am giving out. First, there is much more text than something I would give to student – it’s not that I don’t want it to be eye-catching, but I want it to be informative. That way, it’s an easy reference for faculty to go back to in order to contact us. I want them to know exactly what kind of services we offer to assist in their instruction. I like to keep this general rule in mind: If you use images, only use those that have meaning. How would I possibly get around listing out all the databases that we offer that is relevant to their research and their students? Ideally, if this weren’t a beginning-of-the-semester informative handout, I’d like to create promo materials for specific content or services. Something that is not only eye-catching & brand-oriented, but also one that uses images meaningfully. More to come on that! What kinds of things are you creating from your desk right now? Previous PostBackyard chickens: How to know they’re right for you Next PostFall semester is here again!